Reward your Students for their Outstanding Achievement! Give your students the gift of recognition and motivation. These distinctive certificates will have a significant impact on each and every one of them. See the smiles on their faces, the excitement in their eyes, and an immediate burst of enthusiasm. Show each of your students that their hard work has not gone unnoticed and you'll see their level of confidence grow as they continue to achieve their goals. 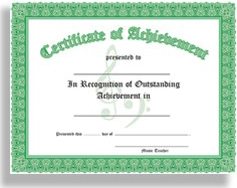 Recognizing your students with an award for Outstanding Participation will ultimately serve to cultivate the flourishing talent that resides within each of them, which will eventually mature into character, integrity, and exceptional musicianship. Here's an easy, but very effective was to reward your conscientious students with the recognition they deserve. Available for any instrument or specifically for piano. Each variety is distinguishable by blue, green, red, or gold borders. Pre-printed on 100 lb heavy stock of superior quality. Unmatched by any other similar type product in print. Includes 10 certificates in each shrink-wrapped pack.